Anyway….the reason I wanted to release this last month is because I remember during the holidays I’d be sitting at the little kid table, which in our case was a card table (and this is a perfect recipe for kids – big & little ones!). My brother would poke me – I would tattle on him, I would kick him – he would make faces at me and our folks would ignore us and laugh. It always seemed like the adult table was more fun than the card table, but now that I’m grown I think they were laughing about our moronic behavior – Don and I were mischievous and quite the handful back then! Even as a child I was always looking ahead and rarely took the time to be in the moment. I guess it makes sense when you’re a kid, but now that I’m an adult it’s time to slow down. 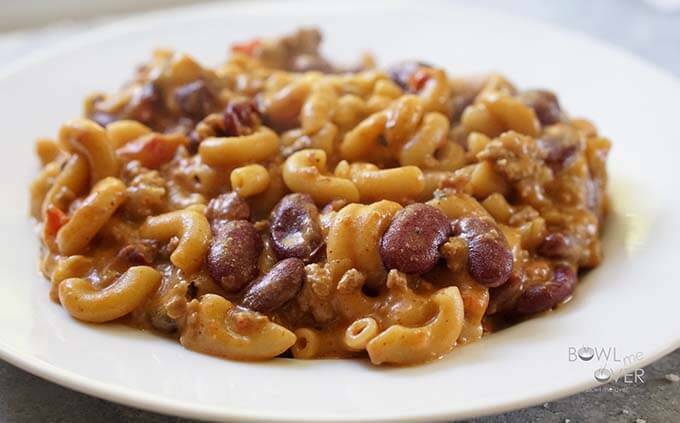 Speaking of being in the moment, Chili Mac and Cheese will definitely want to make you slow down and enjoy every bite! You’re going to love this one – big kids, little kids will stand in line for their second helping and all will clean their plates! Chili Mac and Cheese is one of the best tasting recipes I’ve created. AND it’s super easy and quick, a 30 minute meal. Love chili? 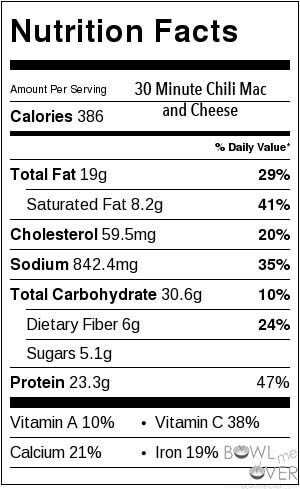 Love Mac 'n Cheese? Well combine the two and you'll have the MOST delicious comfort food! In a large heavy bottom stock pot begin by heating the olive oil. When it is hot, add the chopped red onion & bell pepper. Saute for about 5 minutes until the veggies start to soften. Add the minced garlic and cook for another minute. Then add the hamburger meat, breaking it up, stir until browned. Drain the fat. Drain the kidney beans add them to the stock pot along with the can of fire roasted tomatoes. Add all of the spices salt, pepper, paprika, chili powder and cumin. Stir well to combine. Add the beef broth and increase the heat to high and bring to a boil. When it comes to a boil add the pasta and velveeta cheese. Return to a boil and set the timer for 7 minutes. Stir constantly during the entire 7 minutes. If you don't the cheese will clump together and stick to the bottom of the pan! Once it gets a good boil going, reduce the heat to medium. It will thicken and become creamy and cheesy. This recipe is clearly a trifecta. Mac n cheese with chili? Those two classics combined with a prep and make time of under 30 minutes all add up to a winner with a capital W! This is a fantastic idea and one our kids will love. Absolutely, I know the kids will really enjoy it, thank you!! I’m pretty sure this is perfect timing to release this mega comforting chili!! On cold winter nights, cozying up to a bowl of this would make my grandkids and menfolk all kinds of happy! Lol. You ate just like we did as kids. All the family parties we kids had a card table in the kitchen. Far far away from the formal dining room where the grownups blithely ignored the hollars and shouts. When we got too loud, they shut the kitchen door!! Hahaha! Isn’t that funny, two peas in a pod aren’t we? 😀 I hope you family enjoys this easy meal – thanks Diane for stopping by! The perfect comfort food for winter. Looks delish! Your chili mac looks so good. It’s one of my husband’s favorites that he asks for all the time. I’d like to try your recipe soon. I like that it has some veggies in it. My recipe only has the chili (which I use a vegetarian one). thanks for the recipe. I try to sneak in veggies whenever I can and this recipe needed some “healthy” in it 😀 Thanks Debi – always appreciate hearing from you! Talk about a winning combination! Putting together mac and cheese with chili – brilliant! Thank you! Wait until you try it Kelly it’s mighty tasty!!! Mac and cheese is a crowd pleaser, for sure. This would be perfect on a Super Bowl buffet. 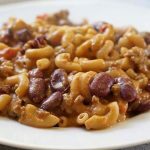 My kids and grandkids will go crazy for this dish as their two favorite dinners are chili and mac ‘n cheese! Thank you for sharing! Comfort food at its best! How can you say no to this? I certainly can’t!!! Yum, yum, yum!!! Thanks Abby! Any recipe that is 30 minutes or less is on my must make list. Your chili mac and cheese is just what we are looking for during this chilly weather. Awesome, I hope you give it a try Joanne! This looks so luscious and wonderful! We aren’t too keen on velveeta in my house though…do you think cheddar would work out ok? Or maybe a mixture of cheddar and another cheese? Absolutely, I’d try cheddar and maybe Monterey Jack cheese? They melt so well together. Let me know if you give it a try, love to hear how your version comes out! my kids would eat this up! Kid tested, hubby approved! 😀 Thanks for stopping by Kristen! I love how you combined two very famous and beloved dishes! The result is amazing! Thank you, this is one of my hubby’s favorite meals Katerina! Great combo, just love this, so comforting for winter!! So true, love my winter-time meals! Super yummy comfort food, I love it! Thanks Justine – I hope you give it a try! 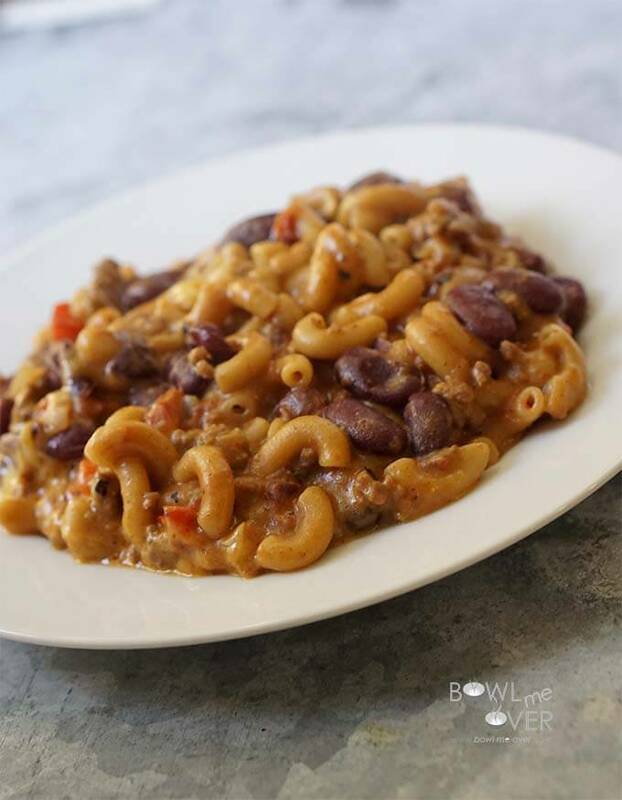 Your chili mac and cheese looks delicious, thanks for sharing with Hearth and soul blog hop, pinning and tweeting. Thank you so much Swathi – I always enjoy your great party and appreciate all the support you send my way!